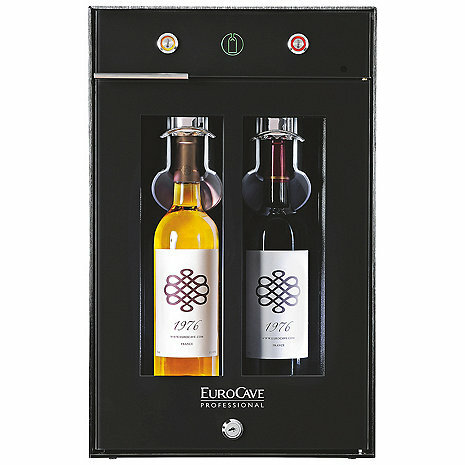 EuroCave's NEW Preservation Solution for Maximum Performance! Keep your opened bottles up to 10 days without affecting quality. The NEW WINE BAR 2.0 is a commercial grade, yet practical, solution which will perfectly fit your wine by the glass offer. With 2 independent compartments and preset temperatures to 46 ° F and / or 60 ° F , the WINE BAR 2.0 keeps your bottles at an ideal tasting temperature (2 bottles) and showcases your selection of wines by the glass thanks to its clean, contemporary design. The wine by the glass solution (without consumables) will keep your opened bottles without altering their organoleptic qualities! Thanks to the air vacuum system ACTIV PROTECT , patented by EuroCave Professional, your wine is protected from any risk of oxidation up to 10 days after opening. WINE BY THE GLASS SERVICE Preserving open bottles and bringing your wine to the correct serving temperature Opting for a EuroCave Professional wine by the glass serving product is your guarantee that your wine will be perfectly preserved and stored at the correct serving temperature... It is choosing a high-tech product to protect your bottles from oxidation and in this way guaranteeing that your wine will be served with its flavors intact, which will delight your customers from the first to the last glass. Two bottles at an ideal serving temperature (1 white/1 red or 2 white or 2 red). For wine to fully express its flavors, it must be served at the correct temperature. In this way, red wines need to be stored at around 16°C, white or rosé wines at around 8°C. Tasting qualities preserved for several days after opening thanks to an innovative air vacuum system. With WINE BAR 2.0, you enhance your wine by the glass service: during service, our exclusive solution allows you to hold the bottles to ensure a personal service at the table for your customers; and when your bottles are placed in the appliance, completely protected, WINE BAR 2.0 dramatically displays them thanks to its elegant glass doors and multi-color LED lighting. It then becomes an extremely attractive wine list! For more information on alternate configurations, please call 800.356.8466 to speak with a Wine Enthusiast specialist. Gross Shipping Weight Approx: 30 LBS. Net Weight Approx: 37 LBS. the wine is dispensing in glass directly or must be take the bottle to serve out of the cave? BEST ANSWER: You have to take bottle out of the Cave and pour ......we are very pleased with the 2.0 unit ! You must remove the bottle to pour the wine directly from the bottle. You must take the bottle out. Some reviews of the Wine Art preserver mentioned noise and others, reliability. About half were satisfied. I prefer to spend more and be completely satisfied. Is the Wine Bar 2.0 what I am looking for? BEST ANSWER: You certainly would not be disappointed with standard Wine Art. The 2.0 is a sleeker model with more advance controls. But is a special order and can take up to 16 weeks. While it took almost 12 weeks to get it, it is well worth the wait. This is the commercial version and so far after 3-4 weeks of use it's working like a charm. The wine does keep as advertised for about a week to 10 days, tasting like it was just opened. We tend to drink high end wines and think it will pay for itself in about a year or so. I will probably get a second unit - there's a kit to bind 2 units together that comes with the wine bar.